There is an overall lack of knowledge about how vaccines work. 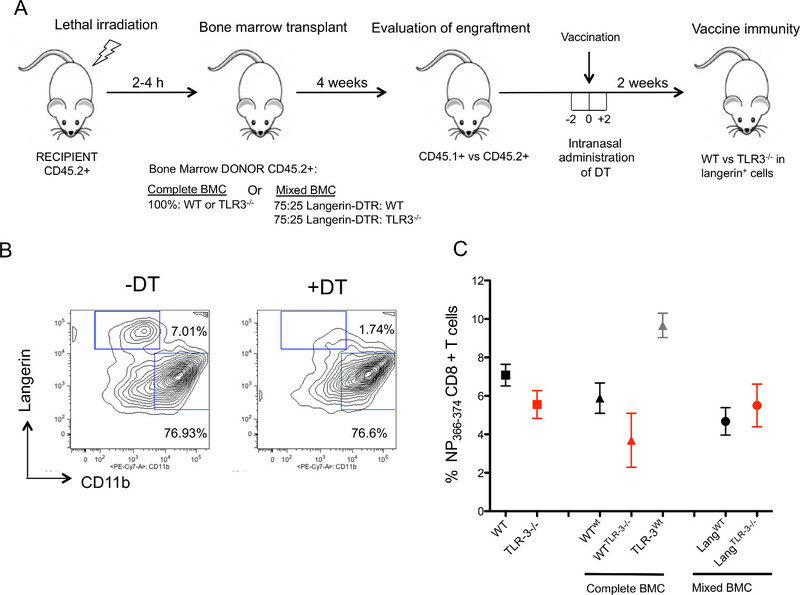 Here we propose the combined use of reverse genetics and bone marrow chimeric mice to gain insight into the early host immune responses to vaccines with a special focus on dendritic cells and T cell immunity. Pérez-Girón, J. V., Gómez-Medina, S., Lüdtke, A., Munoz-Fontela, C. Intranasal Administration of Recombinant Influenza Vaccines in Chimeric Mouse Models to Study Mucosal Immunity. J. Vis. Exp. (100), e52803, doi:10.3791/52803 (2015). Vaccines are one of the greatest achievements of mankind, and have saved millions of lives over the last century. Paradoxically, little is known about the physiological mechanisms that mediate immune responses to vaccines perhaps due to the overall success of vaccination, which has reduced interest into the molecular and physiological mechanisms of vaccine immunity. However, several important human pathogens including influenza virus still pose a challenge for vaccination, and may benefit from immune-based strategies. Although influenza reverse genetics has been successfully applied to the generation of live-attenuated influenza vaccines (LAIVs), the addition of molecular tools in vaccine preparations such as tracer components to follow up the kinetics of vaccination in vivo, has not been addressed. In addition, the recent generation of mouse models that allow specific depletion of leukocytes during kinetic studies has opened a window of opportunity to understand the basic immune mechanisms underlying vaccine-elicited protection. Here, we describe how the combination of reverse genetics and chimeric mouse models may help to provide new insights into how vaccines work at physiological and molecular levels, using as example a recombinant, cold-adapted, live-attenuated influenza vaccine (LAIV). We utilized laboratory-generated LAIVs harboring cell tracers as well as competitive bone marrow chimeras (BMCs) to determine the early kinetics of vaccine immunity and the main physiological mechanisms responsible for the initiation of vaccine-specific adaptive immunity. In addition, we show how this technique may facilitate gene function studies in single animals during immune responses to vaccines. We propose that this technique can be applied to improve current prophylactic strategies against pathogens for which urgent medical countermeasures are needed, for example influenza, HIV, Plasmodium, and hemorrhagic fever viruses such as Ebola virus. The generation of immunological memory in the absence of disease is the physiological basis of efficient vaccination1. Recently, systems biology-based approaches have revealed that successful vaccines such as the yellow fever vaccine, induce a strong induction of innate immune responses and activation of several subsets of dendritic cells (DCs), which in turn, lead to multilineage activation of antigen-specific T cells2,3. Since DCs are the only immune cell population with the ability to activate antigen-specific naïve T cells4, the study of their function during vaccination is critical to understand immune responses to vaccines and to design future strategies against challenging pathogens. A system allowing tracing of different DCs subsets during immune responses to vaccines would be desirable in order to establish an accurate kinetics of DC migration to lymphoid tissues, and therefore to provide insight into the physiological mechanisms responsible for the initiation of vaccine-specific adaptive immunity. Reverse genetics-based approaches offer the possibility to generate modified, live-attenuated vaccines that can be used experimentally with this purpose. Since its implementation on influenza research, plasmid-based reverse genetics has been widely employed to generate recombinant influenza strains including LAIVs. Standard protocols to rescue recombinant influenza viruses require multi-transfection of highly transfectable cell lines with ambisense plasmids (producing both positive and negative sense RNA) containing the eight influenza viral segments as well as amplification in a permissive system such as Madin-Darby canine kidney (MDCK) cells and/or chicken embryonated eggs5. However, the application of reverse genetics to generate molecular tools in order to study the immune mechanisms of vaccination remains unexplored. The generation of new mouse models allowing specific depletion of immune cell subsets, including DCs, has opened new possibilities to understand the basic immune mechanisms underlying vaccine-elicited protection. The comparison between DC subset functions in mice and humans has revealed that, to a great extent, mouse and human DCs are functionally homologous6,7, these findings, strongly suggest that the development of mouse models allowing specific depletion of DCs in the steady state and during inflammatory conditions, may serve to understand the physiology of DC responses in humans. In recent years a number of mouse models have been generated carrying transgenes expressing the simian diphtheria toxin (DT) receptor (DTR) under the control of the promoter region of a gene of interest8,9. Since mouse tissues do not naturally express DTR, these models allow conditional depletion of cell subsets carrying the targeted gene of interest upon mouse inoculation with DT. Thus, our ability to deplete specific DCs and other leukocytes in vivo during physiological processes, has been greatly enhanced by the development of DTR-based ro. However, while these transgenic mouse models have been used extensively to understand the ontogeny of the immune system, their application to vaccine development has been scarcely tested. Here, by combining influenza reverse genetics and DTR-based competitive bone marrow chimeras, we propose a method to study the kinetics of vaccine immunity as well as individual gene function during immune responses to vaccines in vivo. The application of this technology for preclinical evaluation of new vaccines against challenging infectious diseases could help to rationalize vaccine design and to test vaccine candidates in vivo. Animal experiments were conducted according to approved protocols and following the guidelines of the German animal protection law. All staff carrying out animal experiments passed training programs according to category B or C of the Federation of European Laboratory Animal Science Associations. NOTE: The detailed protocol for the generation of recombinant influenza viruses by reverse genetics has been described by previous studies5 and is out of the scope of this report. Briefly, rescue of cold-adapted influenza vaccines (CAV) is done in a biosafety class II cabinet under biosafety level 2 (BSL2) containment, and involves steps detailed below. The transfection and infection protocol follows that of Martinez-Sobrido et al.5. Generate a reassortant cold-adapted influenza vaccine using as background the cold-adapted strain A/Ann Arbor/6/60 (H2N2), as well as the hemagglutinin (HA) and a modified neuraminidase (NA) of the A/PR/8/34 (H1N1) strain (Figure 1A). The modification in the NA gene consists of a PCR-based replacement of a conserved sequence in the protein stalk (residues 65 to 72) by a short cDNA sequence encoding the chicken ovalbumin (OVA)-derived peptide SIINFEKL (Figure 1B). The SIINFEKL peptide is a highly immunodominant peptide in the context of the H-2b MHC class I-restricted response of C57BL/6 mice12. Plate 106 293T cells per well in 6-well plates using DMEM 10% fetal bovine serum (FBS) supplemented with 1% penicillin/streptomycin (P/E). Prepare plasmid transfection mixture: Add 1 µg of each one of the plasmids encoding cDNAs for PB2, PB1, PA, NP, M, NS from the influenza A/Ann Arbor/6/60 strain and 1 µg of the plasmids encoding for the NA-SIINFEKL and HA from influenza A/PR/8/34. Add pre-warmed OptiMEM (15 µl for a final volume of 100 µl/well). Incubate transfection mix for 30 min at RT. Add 100 µl of transfection mix/well and incubate for 16 hr at 37 °C and 5% CO2. Change cell media by DMEM 0.3% BSA 1% P/E at 33 °C and 5% CO2 for 5 hr. Add 106 influenza permissive MDCK cells in DMSO containing 1 µg/ml of trypsin from bovine pancreas treated with L-1-Tosylamide-2-phenylethyl chloromethyl ketone (TPCK-trypsin). Maintain the 293T-MDCK co-cultures for 2 - 3 days at 33 °C and 5% CO2. Collect supernatants of MDCK-293T cell co-cultures and clear by centrifugation at 260 x g for 5 min. Inoculate 9 - 10 day-old chicken embryonated eggs in sterile conditions. To do so, make a hole on the top of the eggshell as indicated by Martinez-Sobrido et al.5. Cover the eggshell with melted wax using a cotton swab and incubate the inoculated chicken eggs for 3 days at 33 °C. Harvest the allantoic fluid from the infected embryonated eggs: Wash the eggshells with 70% ethanol. Open the egg with a very gently crack in the upper part and remove the allantoic membrane using sterile forceps. Use a 10 ml pipette to collect as much fluid as possible (typically 6 - 10 ml). Centrifuge at 260 x g for 10 min at 4 °C and transfer the cleared allantoic fluid to new tubes. For mouse vaccination, anesthetize mice with 5% isoflurane in oxygen using a precision vaporizer. Use a 200 µl pipette to administer 50 µl of PBS containing 103 plaque-forming units (pfu) of the vaccine expressing the SIINFEKL peptide via droplets directly to the mouse nostrils. Three days post-vaccination, euthanize mice via isoflurane anesthesia followed by cervical dislocation. Lift the mouse skin at the midline just below the ribcage with forceps and cut a small incision through the skin with scissors. From the point of incision, make a 3 - 5 cm long cut through the skin towards both head and tail, then two 2 cm incisions from the midline laterally from each end. Peel back the skin to reveal the peritoneal and thoracic cavities. Carefully cut through the membranes surrounding the peritoneum to expose the thorax. To access the mediastinum cut the diafragma and the bottom of the cage rib. Find and remove 2 mediastinal lymph nodes (mLNs), slightly dorsal and laterally adjacent to the thymus, medially adjacent to the brachiocephalic artery, near the ventral side of the trachea. To harvest the mLNs use curved forceps. Place forceps underneath the lymph nodes and pull them up gently. Place lymph nodes in a 6-well plate containing 1 ml of DMEM and remove any connective or fat tissue surrounding the node. Tease each sample thoroughly with two 26 G needles attached to 1 ml syringes. To tease the lymph node, hold it down with one needle while breaking open the lymph node with the other needle. When this is done correctly, concentrated cells bursting from the lymph node are easily observed in the media. Pass all tissue material through a 70 µm nylon filter to obtain single cell suspensions. Centrifuge single cell suspensions for 10 min at 260 x g in a refrigerated centrifuge. Resuspend the cell pellet in 2 ml of Red Blood Cell Lysing (RBCL) Buffer to lyse red blood cells. Allow lysis to proceed for 3 min at RT. Neutralize RBCL buffer via centrifugation and cell resuspension in 2 ml of ice-cold PBS. Plate cells in U-shaped 96-well plates at a concentration of 107 cells/ml in a final volume of 100 µl. For flow cytometry analysis, block cell Fc-receptors using 1 µg of anti-mouse CD16/CD32 antibodies per 106 cells for 15 min on ice. Centrifuge plates and discard supernatants by plate flicking. Incubate individual wells with the surface antibody combination of choice. Typically for detection of dendritic cells in lymph nodes, the antibody cocktail should include: 0.25 µg of anti-CD11c, 0.25 µg of CD11b, 0.5 µg of MHC class II, 0.25 µg of CD103 and 0.15 µg of CD8α in a final volume of 100 µl. For negative gating, add 0.25 µg of anti-CD3, CD19, NK1.1 or a lineage cocktail (Figure 2A). Alternative gating strategies as well as protocols for proper compensation of multiple fluorescent dyes can be found at the website of the Immunological Genome Project. In addition to the surface markers of choice, add 1 µg of an antibody against H-2Kb bound to SIINFEKL to the cocktail. This commercially available antibody will allow visualization of DCs in which the SIINFEKL peptide is bound to surface MHC class I.
Incubate cells with surface antibodies for 30 min on ice. Protect plate from light. Centrifuge plates at 260 x g for 5 min and wash with 2 ml of PBS two times. 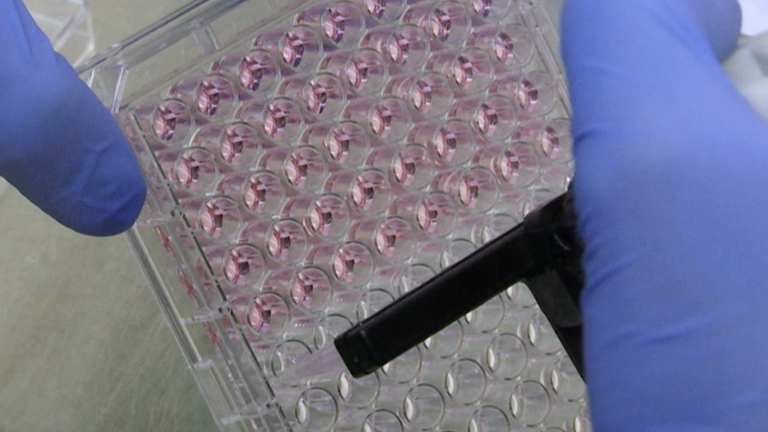 Transfer cells to flow cytometry tubes for analysis. Obtain donor T cells from commercially available TCR-transgenic mice (OT-I mice) (C57BL/6-Tg(Tcr aTcrb)1100Mjb/J) in which all the generated CD8 T cells are specific for the SIINFEKL peptide. Euthanize mice by isoflurane anesthesia followed by cervical dislocation. Harvest spleen by performing an incision in the abdominal cavity. Place spleen/s in 2 ml of DMEM/spleen and remove connective and fat tissue. Generate single cell suspensions from spleen following the procedure described in 2.1.2 and 2.1.3. To further enrich the single cell suspension on T cells, apply magnetic bead separation protocols using either positive or negative selection procedures12. To differentiate donor from recipient cells, use congenic mice so that for example recipient mice express the leukocyte marker CD45.1 while donor T cells express CD45.212. To label T cells, incubate them in 1 ml of PBS containing 5 µM of carboxyfluorescein succinimidyl ester (CFSE) in an optimal cell density of 5 x 106 cells/ml. Incubate cells for 20 min at 37 °C protected from light exposure. After incubation, centrifuge cells at 260 x g for 5 min, discard supernatant, and resuspend cells in 3 ml fetal bovine serum (FBS) to neutralize CFSE. Centrifuge cells at 260 x g during 10 min and resuspend in the adequate volume of PBS so that 100 µl of solution contains 2 x 106 cells. Infuse recipient congenic mice with 2 x 106 cells/mouse via retro-orbital sinus injection13. Euthanize recipient mice at days 3, 4 and 5 post-vaccination using isoflurane anesthesia followed by cervical dislocation. Harvest mediastinal lymph nodes and prepare single cell suspensions for flow cytometry as indicated in 2.1.2-2.1.5. Identify donor cells by staining the single cell suspensions in 100 µl of an antibody cocktail containing: 0.25 µg of anti-mouse CD3, CD4 and CD8 antibodies; 0.5 µg of anti-mouse CD45.1 or CD45.2 antibody (depending on the phenotype of donor cells). Leave the FL-1 channel of the flow cytometer open (FITC) to determine the dilution profile of CFSE12 (Figure 2B). 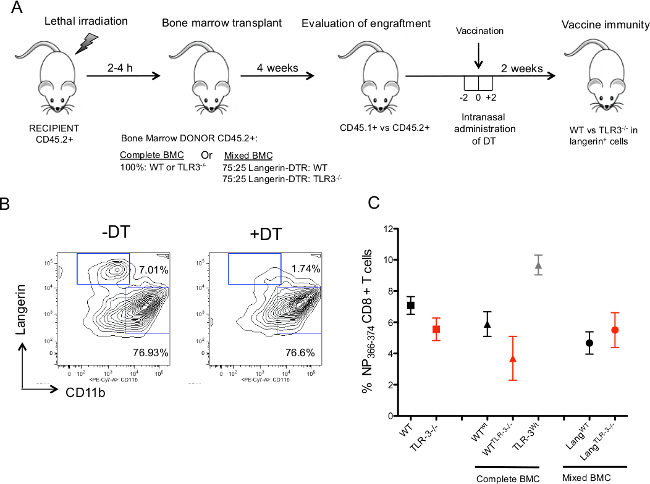 NOTE: The generation of competitive bone marrow chimeras using DTR-based mouse models allows the discrimination of cell-specific functions during immune response to vaccines. Here we show an additional strategy by which combination of DTR-expressing donor cells with cells from knockout mice permits to study gene specific functions during immunity in specific cell compartments. In the example we generate mice with specific deletion of toll-like receptor 3 (TLR3) in Langerin+ CD103+ DCs. Work under a biosafety level II cabinet. Avoid contamination by using exclusively autoclaved instruments. To generate bone marrow chimeric mice, use congenic CD45.1+ C57BL/6 female mice as recipients, and use TLR3-/-, Langerin-DTR/EGFP, or wt mice expressing CD45.2+ as donors. Using congenic donor and recipient mice allows the differentiation of donor and recipient cells via flow cytometry and this allows engraftment to be evaluated. To obtain donor bone marrow cells, euthanize donor mice with isoflurane anesthesia followed by cervical dislocation. With sharp scissors perform incisions around the ankles so that the mouse musculature is exposed. Using blunt forceps pull mouse skin and fur gently from the ankle towards the hips so that leg muscles are visible. With sharp scissors cut mouse legs at the height of the hips and above the head of the femur. Place legs on a petri dish and on ice. Work fast and remove all muscles to expose the bones. Separate femurs and tibiae. Place bones in a solution of 70% ethanol for 5 min to remove possible bacteria and place them immediately on another petri dish containing 5 ml of serum-free DMEM. Cut bone ends using sharp scissors and flush the bone marrow into the DMEM. To do so, flush 1 ml of DMEM into the bone by inserting a 26 G needle attached to a 5 ml syringe. Make sure the bones look white (empty) after flushing. Collect all bone marrow cells from donor mice in 10 ml of DMEM. Generate single cell suspensions from bone marrow cells by passing the harvest through a 70 µm cell strainer. Clear single cell suspensions of bone marrow cells by centrifugation at 260 x g for 10 min at 4 °C in a refrigerated centrifuge. Resuspend cell pellet in 10 ml of PBS. Deplete red blood cells using RBCL solution as described in 2.1.3 and 2.1.4. Count bone marrow cells using either a hemocytometer or an automated cell counter. Assess cell viability by determination of dead cells via trypan blue staining13. Optimally, one single animal yields around 3 x 107 white blood cells/mouse with a viability of at least 80%. In the case of total bone marrow chimeras, prepare TLR-3-/- or wt donor cells. The optimal cell concentration is 2 x 107 cells/ml since 2 x 106 cells in 100 µl of PBS will be used for transplantation. If not used immediately, preserve donor cells at -80 °C using slow freezing techniques and FBS with 10% DMSO. For the mixed chimeric model, mix Langerin-DTR-donor cells and TLR3-/- donor cells in a 75:25 ratio. Prepare a mix of 75 : 25 Langerin-DTR : wt bone marrow cells to generate control mice. Irradiate female mice between 6 - 8 weeks of age in a Cesium-137 source irradiator. Give mice two doses of 550 rad 4 hr apart. Split irradiation minimizes acute hepatic toxicity and therefore reduces mouse lethality due to the irradiation protocol. After irradiation, keep mice under treatment with antibiotics for two weeks. Give antibiotics with the drinking water at 2.5 - 5 mg of Baytril/kg. 2 - 4 hr after the second irradiation, transplant mice with donor bone marrow cells intravenously. Perform the injection of donor cells via retro-orbital sinus injection13 and under isoflurane anesthesia using maximum volume of 100 µl of PBS containing 2 x 106 cells. Four weeks after transplantation, evaluate engraftment in a sample of 100 µl of peripheral blood via flow cytometry using a machine able to read at least two colors. To distinguish between donor and radio-resistant recipient cells, use commercially available fluorescently labeled CD45.1 and CD45.2 anti-mouse antibodies using dilutions between 1/100 and 1/200. Optimal engraftment of donor cells should be at least 80% of total hematopoietic cells in peripheral blood. Vaccinate mice with recombinant live-attenuated influenza vaccine via intranasal. For mouse vaccination, anesthetize mice with 5% isoflurane in oxygen using a precision vaporizer. Use a 200 µl pipette to administer 50 µl of PBS containing 103 plaque-forming units (pfu) of the vaccine. To generate the final mouse model, treat mice with 50 ng of DT diluted in 50 µl of PBS intranasally. Administer DT drop by drop directly to the nostrils of anesthetized mice as described in 3.3.1. Treat mice with daily doses starting treatment at day -2 before vaccination until day 2 post-vaccination (Figure 3B). Generation of recombinant live-attenuated influenza vaccines can be achieved by transfection of plasmids encoding the eight segments of influenza virus under the control of bidirectional promoters5. A cold-adapted influenza vaccine usually contains six segments of a cold-adapted strain as well as the HA and NA of the influenza strain of choice (e.g., H1N1) (Figure 1A). The principle of cold-adaptation is based on virus-restricted replication at 33 °C, the temperature of the upper-respiratory tract (URT) in mice and humans14. Therefore, the vaccine can replicate to some extent in the URT but cannot cause lower respiratory tract pneumonia. Using fusion PCR technology, a conserved region in the stem of the viral neuraminidase (NA) was substituted for a traceable OVA-derived peptide (SIINFEKL) (Figure 1B). To track vaccine-specific responses in kinetics studies we have taken advantage of traceable peptides derived from the vaccine formulation as well as chimeric mouse models. Between day 3 and 6 post-vaccination, SIINFEKL-bearing CD103+ DCs can be detected in the lung-draining lymph nodes12 (Figure 2A). Multiparametric flow cytometry allows quantification of vaccine-derived antigen presentation in real time. In addition, infusion of SIINFEKL-specific T cells allows quantification of vaccine-specific CD8 T cell responses (Figure 2B). To evaluate gene-specific functions during vaccination we devised a mouse model combining DTR technology and competitive bone marrow chimeras (Figure 3A). By doing so, loss of gene function was targeted to specific cell compartments over the course of immune responses to vaccination (Figure 3B, C). Figure 1. Engineering of traceable LAIVs. (A) Influenza segments cloned in ambisense plasmids (pDZ backbone as described by Martinez-Sobrido et al.5) were transfected into 293T cells using Lipofectamine 2000. 24 hr after transfection, supernatants obtained from 293T cells were used to coat influenza-permissive Madin-Darby canine kidney (MDCK) cells in the presence of 1% of TPCK trypsin. All the protocol was performed at 33 °C. 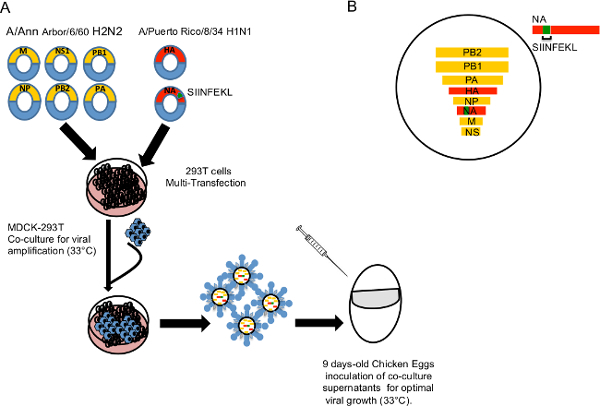 Viral supernatants from MDCK cells were then inoculated into 9-day-old embryonated chicken eggs for three days at 33 °C. Viral rescue was confirmed by PCR-based viral genome amplification and sequencing. (B) To insert the OVA-derived SIINFEKL peptide into the influenza neuraminidase (NA), a conserved region (residues 65 to 72) of the NA gene of A/Puerto Rico/8/34 (H1N1) virus was substituted for a short cDNA encoding the SIINFEKL peptide via fusion PCR. Please click here to view a larger version of this figure. Figure 2. Vaccine tracing techniques. (A) Migratory DCs were gated in the mediastinal lymph nodes (mLNs) as CD11cmed MHC class IIhi cells. In the example, antigen-bearing migratory CD103+ DCs were identified as CD103+ H-2b-SIINFEKL+ cells by flow cytometry. (B) OT-I-specific T cells were infused to mice on the same day of vaccination. Four days after, cells were collected from the lymph nodes of vaccinated mice and assessed for their proliferation profile. CFSE dilution on the FL-1 channel was utilized as indicator of cell division. CAV: Cold-adapted vaccine; CAVSIINFEKL: Cold-adapted vaccine expressing OVA-derived SIINFEKL peptide. Please click here to view a larger version of this figure. Figure 3. Gene function studies. (A) Schematic of bone marrow chimeras (BMC) and vaccination strategies. (-2 and +2 refer to administration of DT two days before or after vaccination). (B) Addition of DT in chimeric mice expressing Langerin-DTR allows specific depletion of migratory Langerin+ DCs coexpressing CD103 in the lung. (C) Comparative analysis of vaccine-specific T cells in chimeric mice. Detection of NP366-374-specific CD8 T cells was done via commercial dextramer staining. Please click here to view a larger version of this figure. In this study we describe how reverse genetics and chimeric mouse models can be utilized to elucidate the physiologic and molecular mechanisms of vaccine-induced immunity. Influenza reverse genetics is established in many laboratories and has played a chief role in understanding influenza pathogenesis, replication, and transmission17. A key point in our protocol is rescue of cold-adapted influenza vaccines expressing foreign epitopes. While the strategy of introducing short cDNAs into the stalk of the neuraminidase has been described by many groups, the investigator needs to ensure that no additional mutations are introduced during vaccine production in eggs and that the vaccine is able to replicate in the respiratory tract without inducing pneumonia5,12. Since both the stalk of the viral neuraminidase as well as other regions of the influenza genome such as the NS gene segment and the PB1 segment allow allocation of foreign sequences19,20, modifications of our protocol can be utilized to add additional foreign peptides to, for example, understand the hierarchies of the T cell immune response against influenza virus, a key point for rational vaccine design. By combining traceable vaccines and DTR-based depletion of DC subsets we have been able to target loss of gene function to specific cell subsets. This technology has been applied before to elucidate immune response to pathogens21, but not to dissect pathways responsible for vaccine protection. Due to the availability of DTR-based models and the flexibility of the technique to generate chimeric mice, this technique could be further expanded to additional leukocyte populations and genes with immune functions. It is important to note that DT treatment may also result in depletion of additional DC subsets expressing langerin such as CD8α+ DCs in the lymphoid tissues. Therefore it is highly recommended to perform a dose-response study to evaluate the effects of DT treatment. A potential caveat of our model is that allogenic bone marrow transplantation has been shown to decrease overall antiviral CD8 T cell immunity15. Thus, caution has to be exercised when comparing data between transplanted and non-transplanted mice. Several key human pathogens for which vaccines are urgently needed can be studied in mouse models using wild-type pathogens or mouse surrogates. These include influenza virus, Plasmodium, and Ebola virus. The techniques proposed in this study may help to understand the basic mechanism of experimental vaccines against these pathogens and therefore, to rationalize vaccine design. We thank Sergio Gómez-Medina for excellent technical support with mouse experiments. This work was supported by funds from the Leibniz Association and the Leibniz Center of Infection. A.L. is a recipient of a pre-doctoral fellowship from the Leibniz Graduate School. FlowJo cell analysis software 9.5 Flowjo inc.
Bevan, M. J. Understand memory, design better vaccines. Nat. Immunol. 12, 463-465 (2011). Gaucher, D. Yellow fever vaccine induces integrated multilineage and polyfunctional immune responses. J. Exp. Med. 205, 3119-3131 (2008). Querec, T. D. Systems biology approach predicts immunogenicity of the yellow fever vaccine in humans. Nat. Immunol. 10, 116-125 (2009). Banchereau, J., Steinman, R. M. Dendritic cells and the control of immunity. Nature. 392, 245-252 (1998). Martínez-Sobrido, L., García-Sastre, A. Generation of recombinant influenza virus from plasmid DNA. J Vis Exp. 3, (2010). Haniffa, M. Human Tissues Contain CD141hi Cross-Presenting Dendritic Cells with Functional Homology to Mouse CD103+ Nonlymphoid Dendritic Cells. Immunity. 37, 60-73 (2012). Haniffa, M., Collin, M., Ginhoux, F. Ontogeny and functional specialization of dendritic cells in human and mouse. Adv. Immunol. 120, 1-49 (2013). Jung, S. In vivo depletion of CD11c+ dendritic cells abrogates priming of CD8+ T cells by exogenous cell-associated antigens. Immunity. 17, 211-220 (2011). Lahl, K., Sparwasser, T. In vivo depletion of FoxP3+ Tregs using the DEREG mouse model. Methods Mol. Biol. 17, 211-220 (2011). Duffield, J. S. Selective depletion of macrophages reveals distinct, opposing roles during liver injury and repair. J. Clin. Invest. 115, 56-65 (2005). Meredith, M. M. Expression of the zinc finger transcription factor zDC. J. Exp. Med. 209, 1153-1165 (2012). Girón, J. V. Mucosal Polyinosinic-Polycytidylic Acid Improves Protection Elicited by Replicating Influenza Vaccines via Enhanced Dendritic Cell Function and T Cell Immunity. J. Immunol. 193, 1324-1332 (2014). Freshney, R. I. Culture of animal cells: a manual of basic technique. bib.usb.ve. (1983). Cox, R. J., Brokstad, K. A., Ogra, P. Influenza virus: immunity and vaccination strategies. Comparison of the immune response to inactivated and live, attenuated influenza vaccines. Scand. J. Immunol. 59, 1-15 (2004). Gowdy, K. M. Impaired CD8(+) T cell immunity after allogeneic bone marrow transplantation leads to persistent and severe respiratory viral infection. Transpl. Immunol. 32, 51-60 (2015).